Tenth Avenue North brings those words to mind on its third album, The Struggle, wherein the notably popular band (more than 700,000 previous records already sold) wrestles with the human condition and hungers for a permanent spiritual home. Hallelujah, we are free to struggle. We’re not struggling to be free. Oh, Father, won’t you forgive them? They don’t know what they’ve been doing. Don’t stop the pain in me. Do whatever it takes to give me Your heart and bring me down to my knees, Lord. The remainder of The Struggle is duly earth-weary and kingdom-focused. With straight ahead rock sensibility, “Where Life Will Never Die” knows, This rusted world can’t satisfy. There’s nothing here that will survive. In the Switchfoot vein, “Strangers Here” anticipates the day when, We’ll touch the face of God and the sorrow will disappear. 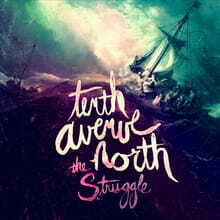 The Struggle is the sound of Tenth Avenue North hitting its creative stride. Don’t let the project’s heavy premise discourage you from listening; this band is a bright spot in modern Christian music.